You’ve heard the name Meridian Title, but do you know how this title agent has used recent activity in a positive way to benefit its business? Learn how one title agent responded and how your business can be prepared. Federal agencies aren’t the only players in the game when it comes to regulations. Learn who else wants to be a participant. What happens in New York doesn’t always stay in New York. Hear from two experts about the state’s regulations on cybersecurity, affiliated arrangements, title fees as well as consent orders and the court case against the New York Department of Financial Services. Learn how these rules and more affect you, even if you don’t live in New York. Chris Gulotta, Founder, The Gulotta Grabiner Law Group, PLLC and Real Estate Data Shield, Inc.
Regulatory oversight on the state level is increasing across the country. Hear from two state regulators and two regulatory experts about how this shift will affect the industry and your business. Flagstar Bank President and CEO Alessandro DiNello will speak to the regulatory issues Flagstar navigated on his watch and how the bank was able to come back from the financial crisis and become one of the largest mortgage banks in the country, as well as one of the few banks to grow its servicing business since the Great Recession. He also will offer a comprehensive view of why marrying quality and profitability is critical to success, as well as his views on TRID, technology development and cybersecurity. Land banks are playing a crucial role in urban communities by taking abandoned properties and making them available for purchase once again. The title insurance industry is the cornerstone of these efforts. Learn from the Detroit Land Bank, an agent participating in these transactions and a lender partner about how you can lead similar initiatives in your community. Title agents are capturing the critical data elements lenders need to meet the new compliance requirements from Fannie Mae and Freddie Mac. Learn how to comply with the UCD data requirements, how to catch errors in mapping which affect the correct display of fees and how to use the data you’ve captured to improve operations. Hear from three national lenders about how everyone involved in closings can address pain points and form a meaningful collaboration. Everyone knows a diverse business is a better business, but many struggle with how to diversify their workplace. The co-chair of Buckley Sandler’s diversity committee will discuss how to overcome challenges, increase diversity and how this will improve your office. After a favorable decision in the PHH case and with a new more reasonable CFPB, there has been a resurgence of interest in marketing agreements, desk rentals, lead generation and co-advertising activities. Settlement service providers however, will still need to comply with RESPA’s safe harbor requirements. This session will discuss the do’s and don’ts for participating in these marketing and advertising activities in a Post-PHH world. Listen to two leaders in escrow as they review real life cases and cautionary tales of escrow fraud. They will also discuss non-digital threats and the appropriate standard of caution. Many states have recently adopted legislation allowing some form of eNotarizations. 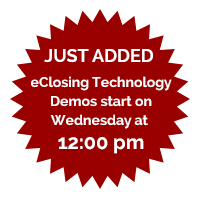 Lenders and title insurance professionals are using these and are on their way to rapid adoption of eClosings. Learn more about eNotarizations and the remaining roadblocks to widespread electronic closings. Get your sales questions answered and learn how to effectively hire, train, supervise and evaluate your sales team. Liberty Title’s Chris Kass will share her success story, while John Haynes helps you learn how to create a sales plan complete with monthly and annual goals. Industry professionals will kick off the session with a live demonstration of an eClosing featuring a remote online notarization. Then, eClosing partners join the discussion for a deep dive into the process and technology involved, and the session concludes with audience Q&A. Walk away from this session with the knowledge and tools to implement eClosings within your operations. Hear from the leaders of some of the top underwriters on the industry’s hottest topics. They will discuss their views on Blockchain and digital mortgage implementation, compliance with state and federal regulations, cybersecurity and more! The industry has been told how to prevent an attack from happening, but what do you do when it happens? Hear real life examples from an attorney, lender and the FTC and how to respond if it happens to you. Learn how Blockchain is being implemented in the real estate sector, from property records to property sales with Bitcoin.